I thought to share the experience I had last year with you. This is a very beautiful place and very close to Nairobi, 45 minutes away! The Kenya Forest Service (KFS) sort to rejuvenate the lush and evergreen Kereita forest so that it can self-sustain. 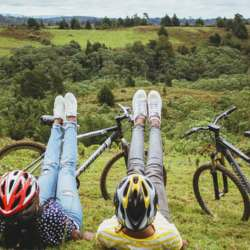 As it later would be, the forest, deserted, but one of the healthiest in the huge span of the Aberdare Ranges, has come to be known as the one-stop destination for adventurous and thrilling outdoor activity. Thanks to a partnership between KFS and a foreign investor, The Forest is now one of the top stops for adventure seekers in Nairobi. Located in Limuru, The Forest also boasts of one of the longest Zip line in Africa. The centre dedicates a share of its profits towards maintaining the extensive span of the Kereita forest. In 2 years, the adventure centre has planted over 20,000 trees into the areas that had faced deforestation from the neighboring communities, and yet more is to be done. We are going to help with this, by planting a tree after lunch! Cycle for 2hrs in the forest then hike to the waterfall then cycle back to the restaurant.